May 2015 be happy and healthy for you and your dogs! 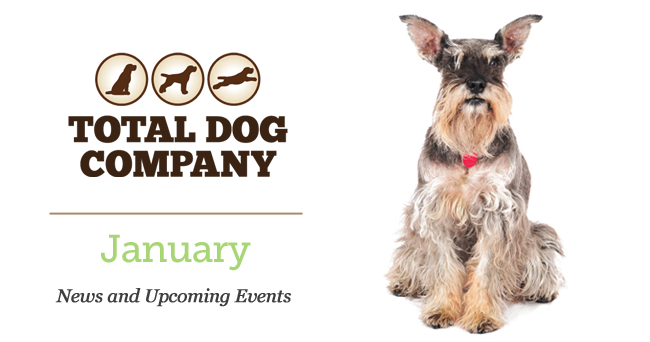 Check out new brands, our January specials, and learn about raw food! Formulated with prebiotics, antioxidant-rich fruits and veggies, and probiotics. Two formulas—Turkey/Chicken and Ocean Fish. Two sizes—3.8 lb. and 22 lb. Prices are 30% off the regular price. Give it a try! 20% off all Canine Caviar dry foods. Plus, all holiday toys have been marked down! We still have plenty of coats and boots to keep your best friend warm and dry during this awful January chill! Still in need of a calendar? 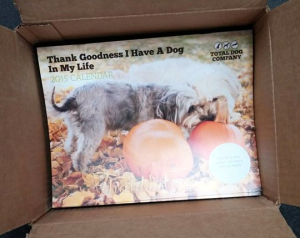 Our 2015 Total Dog Calendar is still available now for $11.95! Have you heard of people feeding their dogs raw food? What does that mean? It means a dog food that consists of “real food”—meat, fish, eggs, and/or fruit and vegetables that aren’t processed or cooked in any way. Some of the “real foods” aren’t things we would eat ourselves, like tripe (ruminant stomach), heart, or chicken or turkey necks, but dogs do well on them and like them. Some people make their dogs’ food at home out of a collection of ingredients that they get from any number of sources. There are a number of books on the market that have recipes for homemade dog foods—one good one is Dr. Becker’s Real Food for Healthy Dogs and Cats. Other people choose to buy pre-mixed raw food. Why Use a Raw Food Diet for Dogs? Why to Not Use a Raw Food Diet for Dogs? The dog who can’t tolerate raw food is rare (with appropriate transition), but there are PEOPLE who shouldn’t have contact with raw foods—those with compromised immune systems, infants and toddlers who touch and put things in their mouths (but we hasten to add that this caution applies also with ANY kind of dog food—note that there have been more recalls of dry food than raw for food-borne illness). Expense. Raw food is expensive—freeze-dried/dehydrated is most expensive, followed by pre-mixed frozen, BUT canine nutrition guru Steve Brown points out in his book Unlocking the Canine Ancestral Diet that just one raw meal a week imparts many of the benefits of raw feeding without making you go broke. There’s another school of thought that believes each dry food meal can be supplemented with raw food (like spreading that one raw meal out over the whole week). Deal with raw dog food the same way you should deal with the raw meat you feed yourself and your family: wash hands thoroughly after touching the raw food, don’t reuse surfaces and utensils that have touched raw food for other non-cooked items. The dish you use to serve raw food to your dog should be glass, ceramic, or stainless steel and should be washed after use (Note: plastic dishes can harbor bacteria even when used with dry food). We have a broad selection of frozen food! We also carry some supplements to use if you’re making food from scratch—check our supplement aisle. Ask Sue or Shirley for advice or suggestions—both have experience with raw feeding!